The all-new 2015 version of the segment-dominating Chevrolet Tahoe SUV is even better than it needs to be. The 2015 chevrolet tahoe electric vehicle qualifies for a federal tax credit of up to $7,500, effectively reducing the net base price. If there was ever a case for, "if it ain't broke, don't fix it," it was the Chevrolet Tahoe. GM's stable of full-size SUVs – which includes the GMC Yukon – already dominate the full-size SUV class to the tune of owning around 70 percent of the market. They outsell Ford 5-1, and Toyota 10-1. Yet Chevrolet went all out with the 2015 Chevrolet Tahoe, giving it an all-new chassis, all-new styling, an upgraded suspension and engine, and an interior that's more luxurious than the last-generation Cadillac Escalade. Throw in class-leading technology, and it's clear that there's little out there to dethrone this king of the road. If you need real 4-wheel drive (4WD), if you tow a trailer or a boat, and if you want to do that surrounded by the best interior and some of the highest tech you can get in the segment, then this is your ride. If the idea of a full-size SUV is just too much vehicle, if you value fuel economy over sheer towing capacity, or if you can't stand upright inside your garage, then you might want to pass on the new Tahoe. Everything about the 2015 Chevrolet Tahoe is new this year. It now rides on an all-new frame derived from the new-for-2014 Chevrolet Silverado. The engines have been upgraded with advanced technology to improve horsepower and fuel economy, and the new interior could be out of luxury sedan. The 2015 Chevy Tahoe is still a big, heavy full-size SUV, yet Chevy has managed to infuse the new Tahoe with a smoother ride, sharper steering, and overall better driving dynamics than you might expect from such a large vehicle. Key to this is the available Magnetic Ride Control (MRC), standard on LTZ trims, which adjusts the stiffness of the shock absorbers in milliseconds according to changing road conditions. The result is little body lean for a vehicle this size, but with a compliant ride. Unlike its competition, the Tahoe still has a solid rear axle – normally that means a harsher ride – but MRC helps here, too. The suspension, newly responsive steering and 355-horsepower V8 engine combine to make the Tahoe easy to drive on mountain roads. The biggest downside is fuel economy, which hovered in the mid- to high-teens despite tricks like cylinder deactivation. This is the best interior treatment we've ever seen in a domestic SUV. We're not exaggerating when we say the 2015 Tahoe LTZ interior is nicer than the one in the previous-generation Cadillac Escalade Platinum. Better late than never, they say. While much of the Tahoe's competition has embraced fold-flat seats for more than a decade, this is the first time you don't have to remove this big Chevy's third row to maximize cargo room. The power fold mechanism even works quickly. The 2015 Tahoe's driver's seat features multiple adjustments, so it's easy get comfortable. The materials feel upscale, and we liked the easy-to-understand control layout. Adults will wish the 2nd-row captain's chairs adjusted forward and back, not just for seatback angle, but that's better than the tiny third row – its poor footroom and legroom make it for kids only. There's not much space behind the third row for cargo, but the new raised floor – there to help make a flat cargo floor when the third row's folded – features a handy storage area beneath it. With the 2015 Tahoe, Chevrolet continues to put daylight between its pickup trucks and the SUVs based on them. The new Tahoe shares no exterior panels with the truck it's based on, giving designers unprecedented freedom. The silhouette is familiar, but the sharp-edged styling, sculpted flanks, and cool LED-accented headlights strike a bold look for this big brute. Parked side by side, the Tahoe looks wider than its GMC Yukon cousin – credit the wide grille, which blends into the headlights. We also liked the optional power running boards. Every Tahoe comes with the 5.3-liter V8 engine and 6-speed automatic transmission. Base LS trims get cloth seats, Bluetooth for phone and audio, automatic climate control, and rear parking sensors. Mid-range Tahoe LT trims get forward-collision alert, lane-departure warning, Chevrolet MyLink infotainment, and Bose audio as standard equipment. The top-line LTZ trims add rear cross-traffic alert, blind spot alerts, Magnetic Ride Control, and 20-inch wheels. Note that if you want to seat eight passengers, you can't go higher than the LT since LTZ trims come only with two captain's chairs in the middle row. If you miss the old-time feel of a front bench, the 2015 Tahoe LS is your dream vehicle, since you can still order one. The LTZ's luxury touches – most of them anyhow – can be had on the LT thanks to the $2,705 Luxury Package. The $3,305 Sun, Entertainment and Destinations package bundles navigation, a rear-seat entertainment system with Blu-ray, and a power sunroof on LT and LTZ trims. The security package adds a vehicle tilt sensor – in case someone tries to steal your wheels – and an interior motion sensor, a relative bargain at only $395. 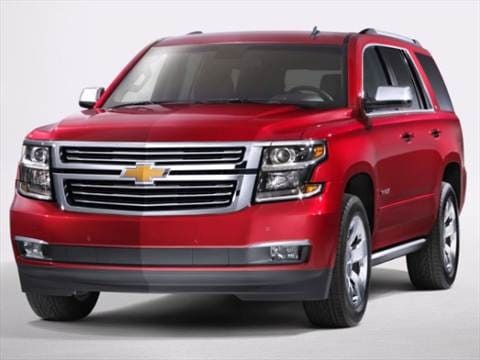 The 2015 Chevrolet Tahoe comes with one engine: a 355-horsepower 5.3-liter V8. That sounds familiar to Tahoe fans, but this engine is significantly different from its predecessor. It features direct injection, which helps improve fuel economy while also increasing power and torque, a nice trick. It also features GM's Active Cylinder Management, which imperceptibly shuts off half of the cylinders under steady cruise to help preserve fuel. The engine comes connected to a 6-speed automatic transmission. And of course, you can get 4-wheel drive with a proper off-road-ready low range. Prices increase across the board for the 2015 Chevrolet Tahoe by at least a couple thousand dollars. LS trims start at about $46,000 for 2-wheel-drive (2WD) models, while mid-range LT models start at about $51,500. If you want as much chrome and leather possible on your Tahoe, the LTZ trims start at about $61,000. Add $3,000 if you want 4-wheel drive on your Tahoe. That's more expensive than a Ford Expedition and Nissan Armada – the Toyota Sequoia is about the same – but the Tahoe is a big step up in equipment and refinement. Historically, the Tahoe's resale value is no better than its Ford and Nissan rivals, and trails the Toyota Sequoia. The Kelley Blue Book Fair Purchase Price tells you what other buyers in your area are paying for their 2015 Tahoe, so check it out before you make your purchase. Best vehicle we have ever owned. One of the best if not the best vehicle we have owned. Have had other makes but none surpass what the Tahoe offers in its overall package. I love just about every about this vehicle. Ride, comfort, technology. Traded UP!!! from a Mercedes ML 350. Absolutely pleased. Need I say more. like my 2016 Tahoe quite a bit!! Chevy Tahoe - GREAT SUV GREAT VALUE!!! !